MJ Kim/MPL Communications Ltd.; Claude GassianLast year, many big-name artists announced tours for 2019. 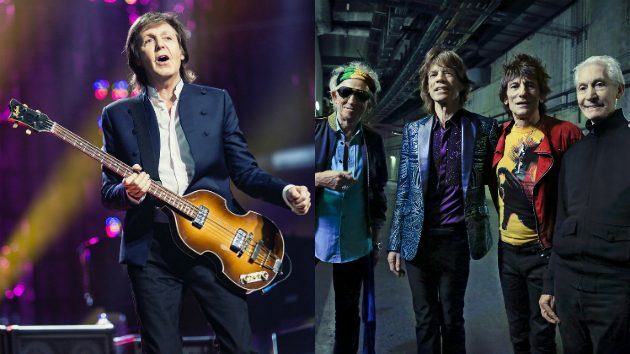 Now, Entertainment Weekly has chosen 12 of them as the “Can’t-Miss Tours of 2019” — the ones you should be sure to grab tickets to — and among them are treks by such legends as Paul McCartney, The Rolling Stones, Queen, John Mellencamp and Cher. As previously reported, McCartney kicks off the 2019 edition of his Freshen Up Tour on March 20 in Santiago, Chile, and will bring the trek to North America in the spring, starting with a May 23 concert in New Orleans. The Stones launch the U.S. edition of their No Filter Tour on April 20 in Miami Gardens, Florida. The 15-date trek is mapped out through a June 25 concert in Chicago. Riding high on the success of the hit biopic Bohemian Rhapsody, Queen joins forces again with one-time American Idol runner-up Adam Lambert for the Rhapsody tour, which gets underway July 10 in Vancouver, Canada. Mellencamp will celebrate his long career while promoting his new covers compilation Other People’s Stuff on a trek dubbed The John Mellencamp Show, which starts with a February 7 concert in South Bend, Indiana. Cher’s Here We Go Again tour, in support of her ABBA covers album Dancing Queen, begins a U.S. leg on January 17 that wraps up in May. In between, she’ll do nine shows in Las Vegas as part of her Sin City residency. EW also recommends tours by the Grateful Dead spinoff group Dead & Company, country star Carrie Underwood, pop superstars Ariana Grande and Mariah Carey, rappers Meek Mill and Vince Staples, and 1980s boy band New Kids on the Block, the latter of whom will be bringing along Debbie Gibson, Tiffany, Salt-N-Pepa and “O.P.P.” rappers Naughty by Nature.